Gil Ullom, Cardington Rotary Club treasurer and Dawn Ruehrmund, Cardington third grade teacher. Also pictured are third grade students Cameron Romine, Lydia Levering, Cadence Fleming and Cyrus Linkous. This was the comment by Cardington-Lincoln third grade student Madison Lauthers upon receipt of a dictionary, one of 84 given to the school’s third-grade students by the Cardington Rotary Club. Gil Ullom, the club’s treasurer, distributed the dictionaries, continuing a tradition by the club for over 20 years. Third-grade teachers at Cardington include Dawn Ruehrmund, Janet Sedlacek, Cindy Eyman and Michelle Goughenour. Others receiving dictionaries from the club were ten third grade students in Gilead Christian School; 90 in the Mt Gilead Elementary School and 145 in the Highland Elementary School. Third-grade teacher at Gilead Christian School is Rachel Dresback. Third grade teachers at Park Avenue Elementary are Maggie McElroy, Kim Porter, and Lindsey Wyeth. Ninety students received dictionaries. One hundred forty-five Highland third graders will receive dictionaries. Teachers are Lisa King, Ariel Deere, Michelle Duncan, Pam Arnold, Scott Bailey, Kelly Stannard, Cheryl Hilborn and Tasha Terrill. 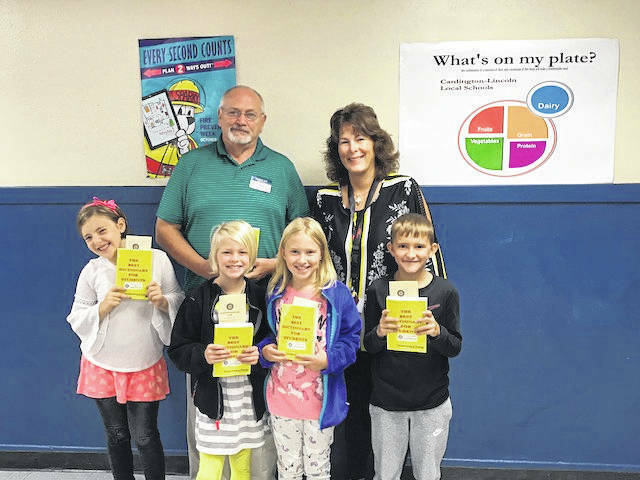 Third grade students in the Northmor School district receive dictionaries from the Galion Rotary Club. Ullom advises each of the third grade recipients to place their names inside the dictionary cover and leave them at school. He said Rotarians have given over 15,033,000 dictionaries since 2002 and they are provided to students in all 50 states. He said the goal of The Dictionary Project is to reach every third-grade student in the United States. So far this year they have reached an estimated 573,392 students and cumulatively they have reached an estimated 30,687,857 students. Of that number, 1,728 were sponsored by the Rotary Club of Cardington. https://www.morrowcountysentinel.com/wp-content/uploads/sites/29/2018/09/web1_IMG_4085-2-.jpgGil Ullom, Cardington Rotary Club treasurer and Dawn Ruehrmund, Cardington third grade teacher. Also pictured are third grade students Cameron Romine, Lydia Levering, Cadence Fleming and Cyrus Linkous.